I try to be as nonpartisan as possible on this blog, and how I've done this until now was to avoid talking about the presidential election pretty much altogether. Well, I'm going to go out on a limb a bit here. While I won't directly tell you which presidential candidate to vote for, I'm going to provide you with the endorsements of some environmental advocates (how passive-aggressive of me!). So if you haven't decided yet, maybe this will help! 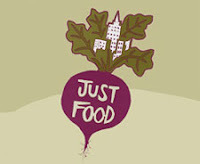 Just Food works with local farms and communities in New York City to create a just and sustainable food system. They do this through community supported agriculture (CSA) programs that help family farms stay in business, while providing city dwellers with access to locally grown produce that's both high quality and affordable. SolarOne works to educate the public -- especially students in grades K-12 -- about renewable energy and the urban environment around them. One of their programs, called TruLight, empowers students to be green entrepreneurs through the marketing and sales of compact fluorescent light bulbs. SolarTwo, the city's first carbon-neutral or net-zero energy use building, is expected to open next year. Miquela mentioned so many incredible projects they are working on it was hard to keep up. They provide green job training and placement in jobs like green roofing, river front restoration, and brownfield restoration through their B.E.S.T. program. As part of their solid waste and energy program they're part of a coalition that created a zero waste campaign, which provides the city with an action plan on how to achieve it.